HappyFox Help Desk is a simple, powerful customer support and ticket management software. 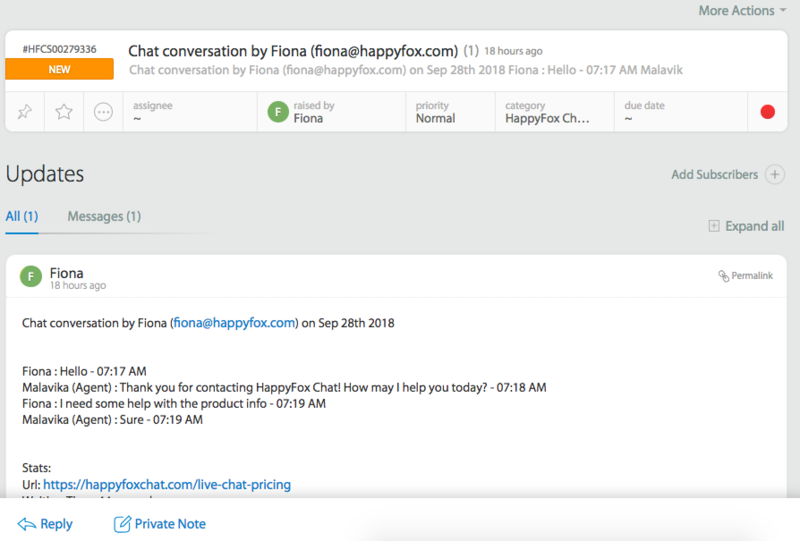 You can integrate HappyFox Help Desk and HappyFox Chat account to convert all chats and offline messages into tickets and followup/resolve your customers’ queries. 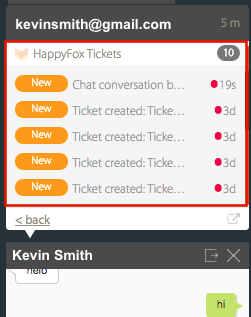 New tickets are created on HappyFox Help Desk for every completed chat, missed chat and offline message. During an ongoing chat with repeat customers, you can view their past tickets along with the ticket's status. 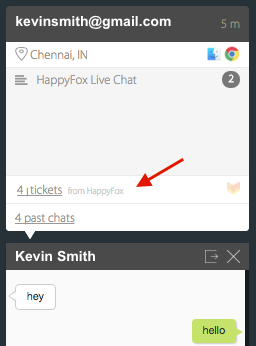 View the ticket details on each chat transcript under Chat History on HappyFox Chat account. Adding tags to a chat will be directly updated to the chat's ticket. Only Admin of HappyFox Chat account can enable the integration. 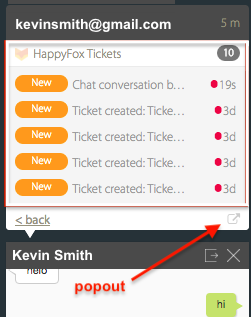 Ensure that Collect Visitor Name and Email option is ON under Manage Section in your HappyFox Chat Account. Tickets will be created for chats only if there is a name and email address/phone number. 1. HappyFox Account URL: Copy your HappyFox Help Desk account's URL to a clipboard (usually of the format: 'accountname.happyfox.com' or 'support.yourcompany.com'). Login to HappyFox Help Desk account.Click Menu >> Apps >> Goodies >> API. To get the Auth Code for the API Key, hover over an API key that you've created → click See Auth Code link. From the resultant pop-up, copy API Key and Auth Code. To create a new API Key follow the instructions here. Step 2: Go to Apps → HappyFox. Step 4: Under Connect your HappyFox account, enter HappyFox Account's URL, API Key and Auth code → click Connect button. Step 5: Update your preferences under Settings and click Update settings button. Note: The Category drop-down will show only those categories from your HappyFox Help Desk account which are of Availability type as Staff & Contacts. a. Agents can see previously created tickets. Note: If you’re unable to view customer info, simply type ! and choose !refreshVisitorData to refresh the customer information meta area. b. Clicking on the number of tickets, you can view the list of all the tickets created under the particular visitor's contact along with current statuses of each ticket. c. When you click on any of the tickets, you will be directed to the respective ticket on HappyFox Help Desk app in a new tab. d. Clicking on the 'pop-out' icon will direct you to the respective Contact's details page on HappyFox Help Desk. 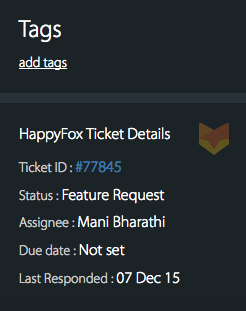 The tag added to a particular chat on HappyFox Chat will also be added to the chat's ticket on HappyFox HelpDesk. 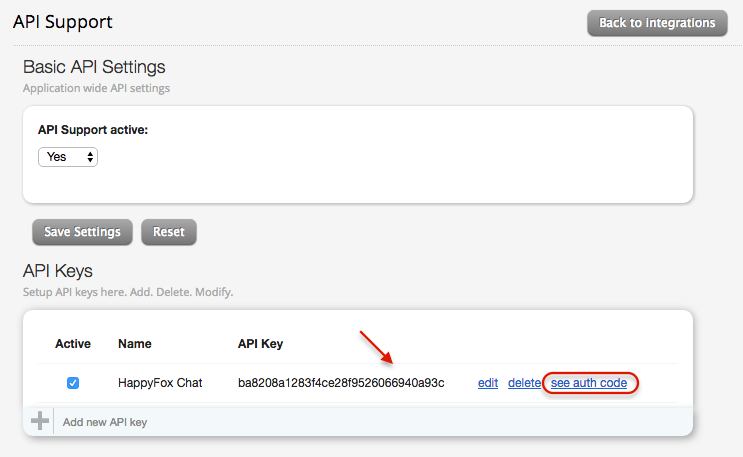 All the Chat Transcripts under Chat History will have the HappyFox ticket details in the right side pane. Clicking the ticket ID will redirect you to the ticket.